Imagine having a qualified team of web-based learning experts build you a state-of-the-art e-learning academy that enables you to deliver an unparalleled client experience that produces raving fan results, never-ending referrals and effortless upsells. 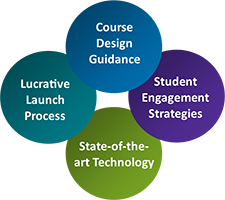 Once you are assigned your Content Manager, they will walk you through our proven four step process for getting your academy up and ready for a lucrative launch using our Course Creation Resource Center. Let us transform your programs, products and process into an e-Learning academy that enables you to serve more clients, deliver on your promise, inspire high-end upsells and automate your revenues. Let’s discover your next best move! CLICK HERE to answer a few questions so we can better serve you. Connect with us personally at Support@VirtualAcademyBuilder.com.